Trunks 1.2-1.8 m (4-6 ft.), 8 cm in diameter; stipes warty, persistent, 40 cm long, 1-1.5 cm in diameter, purple polished; stipe scales dark brown, shiny, narrowly lanceolate. 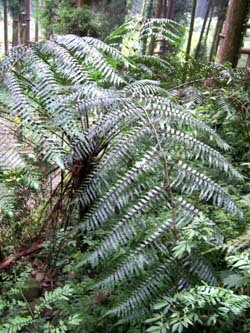 Fronds bipinnate, large; rachis and rachillae purple, smooth on underside, pubescent on upper side; pinnae to 60 cm long; pinnules about 10 cm long, short stalked, the margins crenulate to dentate, often lobed on large frond, cut 1/4 or less to midrib; lower surface without hairs or scales; veinlets in 4-5 pairs per segment, simple, nearly parallel with central vein. Sori round, exindusiate, usually only 1 borne near base of a veinlet; young crosiers with long linear brown scales.